Beef ribs taste great and make an interesting presentation for the holidays or any summer day. They are usually very expensive to have out, but we found them for about $3/pound (December 2008) at our local grocer. So we started with two racks, about 3 pounds total, although the bones on beef ribs are a lot larger and heavier then with the more familiar baby back pork ribs. Beef ribs also have less meat than you are paying for because of the size of the bones, but they have a richer taste than pork ribs. They do not fall apart quite the same way as pork ribs either, so they are easier to move once cooked. Pork ribs tend to completely fall apart when you try to move them. We laid them out on a half sheet pan the night before and coated them with a dry rub, sometimes referred to as a dry brine because of all the salt in the rub. Rub the mix all over the ribs, coating both the back and the front. Cover with foil and let sit overnight. Preheat your over to 325 degrees F and cook for 2 hours. Then remove the foil and rub a little barbecue sauce on the top (presentation side) of the ribs and place under the broiler for 5 - 10 minutes. They will be tender and should have a very beefy flavor, but do not rush the cooking process because the meat can become tough if the heat is too high. The bones have a lot of flavor and really should be used. If you take the bones and sautee them with some butter on high heat you can begin to make a great beef stock to use in soups or stews. Salisbury Steak is a great way to serve a large tough piece of meat. By the time the meal is ready the meat will be easy enough to cut with a fork. The goal is to not have the meat totally fall apart. You want the pieces to stay intact but to be buttery and smooth. We served this meal with mashed potatoes, but green beans, rice or just about anything else would work great. Pre-heat the oven to 300° F.
Lightly flour each sides and use a meat mallet to work the flour into each piece as the meat tenderizes and becomes thinner. 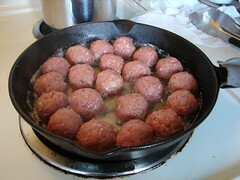 In a large dutch oven (5 - 8 quarts) sear the tenderized meat for 4 minutes on each side. Add salt and pepper to each side. Remove the seared meat and put aside while you sear the next piece. Rough chop the celery, onions and carrots. Add to the pot and deglaze with white wine or vermouth. Add 2 - 3 cups chicken stock. Place the meat back in the pot and cook in the oven at 300° F for about 3 hours. This spicy beef filling is wonderful to put inside the stuffed breads / hot pockets. This ragu is musty and flavorful with onions, carrots, tomato paste and a range of spices. In a cast iron pot or large stainless steel skillet, fry the beef in the olive oil until it's just starting to gain some color. Add the diced onion and sauté for about 10 minutes until adding the carrots and the garlic. Continue to saute for another 10 minutes. At this point, add all the salt, spices. herbs, tomato pure, sugar, worcester sauce and vinegar. Stir and let cook for another 10-15 minutes until you have a nice ragu on your hands. Sweet, spicy, smokey and oh so tasty. Are you used to old tacos with ground beef and a taco mix? Forget about it! These fresh, great tasting tacos take Mexican food up to a whole other level. Although this recipe was inspired by a pair of Korean tacos we had out, the ingredients are primarily Mexican: suffice it to say, you could probably call this recipe a fusion between the two cuisines. By upgrading the meat here to flank steak (skirt steak would work too), instead of using the much more common ground beef, you make the dish far more interesting. We cook the meat, slice it thinly, and then add it to a very flavorful sauce which couldn't be easier to make, provided of course you have a can of smokey chipotle chilis in adobo sauce on hand. Without it - or without some other equally good smokey chili sauce, the finished product won't be nearly as good, so you definitely don't want to skip this step. The sauce comes together quickly: ketchup (or canned tomatoes would work too), vinegar, brown sugar, chipotle chiles in adobo sauce, soy, worcester and a touch of sesame oil. It sounds like quite a few ingredients, but there really aren't too many and you probably have most of them in your pantry anyway. The tender, flavorful meat goes well with some nice crispy shredded cabbage studded with fragrant cilantro. We also added avocado, because when can you ever go wrong with avocado? as well as a dollop of sour cream (which moved this dish into Mexican territory as opposed to Korean...) Anyway, this additon mellowed the heat a bit and completed the dish. So try this - it's unexpected and will make you think about tacos in a whole new way. Combine all the ingredients for the sauce and bring up to a simmer. Let cook for about 15 minutes, taste and see if the balance is good. Meanwhile, salt and pepper the flank steak well and cook it over pretty high heat. Allow to rest, then slice in fine pieces. If more cooking is needed, quickly saute the slices over high heat, and then add them to the sauce. Let cook for few minutes to distribute the flavors. Mix the shredded cabbage with the chopped cilantro. Take two steamed corn tortillas (so it keeps together better), add some meat and sauce, top with cabbage and cilantro, avocado and sour cream. Enjoy! We love to make this dish over and again because it tastes great and the individual portions are a perfect size. Just cut them in half to save some for later, or to split with someone else. We usually serve the meat loaf with a baked potato and some kind of vegetable like the string beans in the above photo. This sliced zucchini and meat sauce casserole is a bit like a lasagna, but without the pasta. It's a very flavorful dish to make, and feels a lot like comfort food. This dish is great to make if you happen to have a lot of zucchini on hand, or if you simply try to eat less carbs. Even though it doesn't have pasta in it, it's still delicious with a rich and flavorful meat sauce that contains some red wine. Here we like to go flavorful, yet pretty cheap. There is no point in spending a lot of money on a wine here, so go for something which you would like to drink with the meal, but nothing too fancy. We usually like to use a Chianti or something similar. Zucchini has a lot of water in it, so to prevent the dish from getting too watery, it's a good idea to first slice the zucchini and apply a liberal amount of table salt over it. When placed in a colander, the zucchini will release liquid and will be perfect to use after 20 to 30 minutes. This meatless lasagna would work well to freeze, so if you're looking for a nice dish to make frozen lunch boxes with to take to work, then this would be a great choice. Put the oven on 375 degrees. Slice the zucchinis thinly and salt liberally between the slices. Place in a colander and let sit to release the water. Using a large pot, put the heat on pretty high and add the ground beef, cook for a few minutes until brown, add the onions and continue to cook another 10 minutes or so. At this point add the garlic, the oregano, basil, salt and pepper. Add the tomato paste and then cook for a minute or two before adding the diced tomatoes and red wine. Let simmer for about 15 minutes, then add the sugar and balsamic vinegar. Taste and possibly add some more salt and pepper. Now rinse the zucchini of excess salt and dry with a paper towel. Utilizing a 9x4 dish, first put in a layer of meat sauce, then a layer of sliced zucchini and then some grated cheese. Repeat with another layer of meat sauce, then the rest of the zucchini slices, more meat sauce and a layer of grated cheese on top. Cook in the oven for about 30 minutes until nice and brown on top. Serve with a crisp salad, some crusty bread and a glass of the remaining wine. We usually make hamburgers with ground chuck or sirloin, or a combination of both, but this time we had some frozen beef tenderloin and decided to try making a burger with that instead. Given that beef tenderloin does not have much fat we also added a little sausage. The result was really good, even though all the ingredients were frozen and we ground everything in a food processor, the patties came together really well. We even got a chance to use a little trick from the "America's Test Kitchen" so that the meat was nice and flat when it cooked. Frozen meat can be difficult to chop, so be careful and run them under some cold water so that they are not too slippery. Chop all the meat in pretty small pieces. Place in the food processor in small batches and pulse until ground. Heat a cast iron pan for a few minutes on medium-high. Form into 5 ounce patties (150 grams) and place an indentation in the middle of each burger so that when it cooks it does not rise up too much. 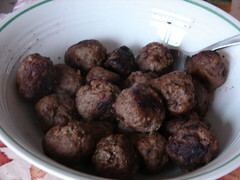 Swedish meatballs are real comforting fall and winter food. Warm, hearty and oh-so tasty, they are a perfect project on a dreary Sunday afternoon. We like to make a double (or triple) batch and freeze some, because they are perfect to keep on hand in the freezer. 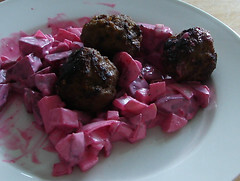 Swedish meatballs are usually quite small as opposed to Italian meatballs and traditionally served with gravy, boiled potatoes and lingonberry jam. If you can’t find lingonberry jam, a nice cranberry sauce is a possible substitute, since cranberries share the lingonberry’s sweet tartness. These meatballs are also nice to serve next to a red beet salad – or favorite is making sandwiches using a dark bread, red beet salad and meatballs cut in half. That’s also quite a traditional combination, and for those of you who never heard of it, you should really try it, because it’s quite good! In a small bowl, combine hot milk, bread crumbs, crumbled bullion cube and chopped onion. Stir and set aside and let swell for a few minutes. 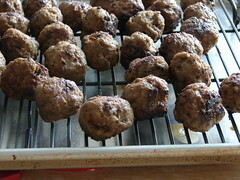 combine the meat, the bread-and-milk mixture, the eggs, the Worcester sauce and the spices. Either mix well with a wooden spoon or beat on medium speed for 1 to 2 minutes. When you have rolled them all out, heat some butter in a cast-iron pan. 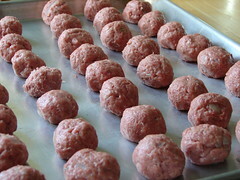 Wait until the butter is warm and bubbly, and carefully add the meatballs. Be sure to not turn them too soon, you want to make sure they form a nice surface before rolling them around, or they might break. Sauté until golden brown, about 7 to 10 minutes, then transfer to another sheet pan and start a new batch. If you’re planning to eat these right away, then you can keep them in a low oven to keep them warm, while you sauté the rest. If you want to cool them, you can place them on a sheet pan with a drying rack on top turned upside down with some paper (newspaper or paper towels) between the sheet pan and the drying rack. This will help absorb any extra fat or drippings. Once you’re done cooking, you could utilize the scrapes of the pan and make a gravy. Simply whisk in some flour to make a roux. Next, add some beef stock, or some water, and finish off with some heavy cream. Possibly season with some extra salt and pepper.